Long time back, for a get together party I wanted to make Carrot Kheer and needed condensed milk for the kheer. But I ran out of it, then got reminded of Sharmi's Post and checked her recipe. Unfortunately, the recipe needs milk powder and icing sugar which i don't have it in my pantry that time. For any recipe that uses milk powder, I use Milk-Mawa Powder instead. So I substituted milk powder with Milk-Mawa Powder & used regular granulated sugar. It turned out perfectly smooth and rich and more tasty than the canned ones. 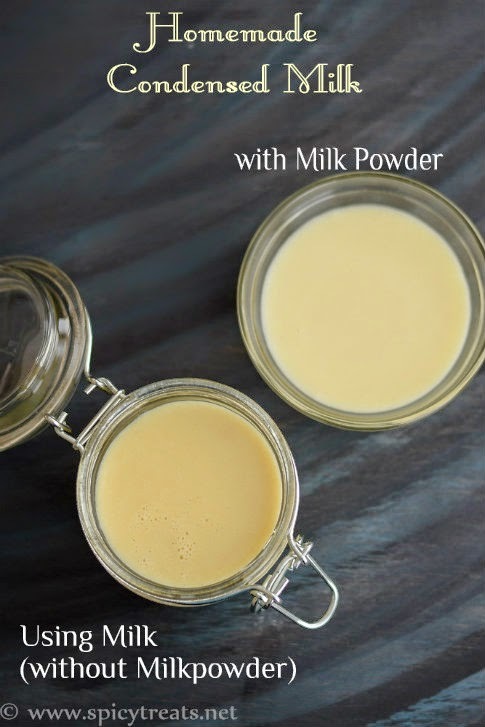 From that time, I started making my own Sweetened Condensed Milk for Eggless Cakes, Sweets & Desserts. 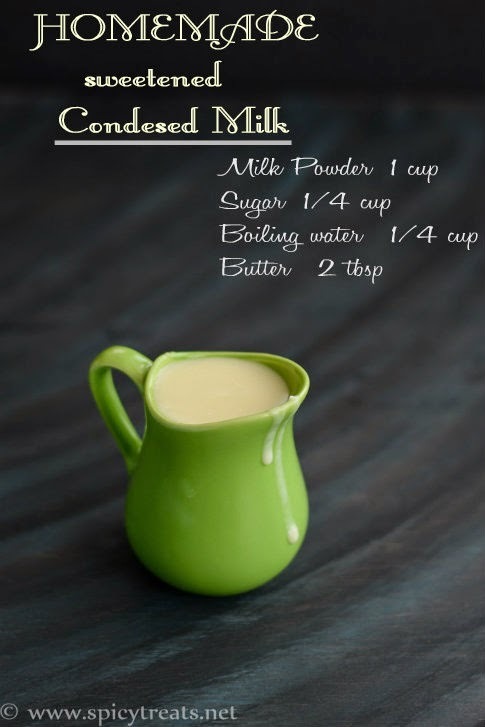 Later, I found this recipe of Homemade Condensed Milk without milk powder and using Whole Milk. 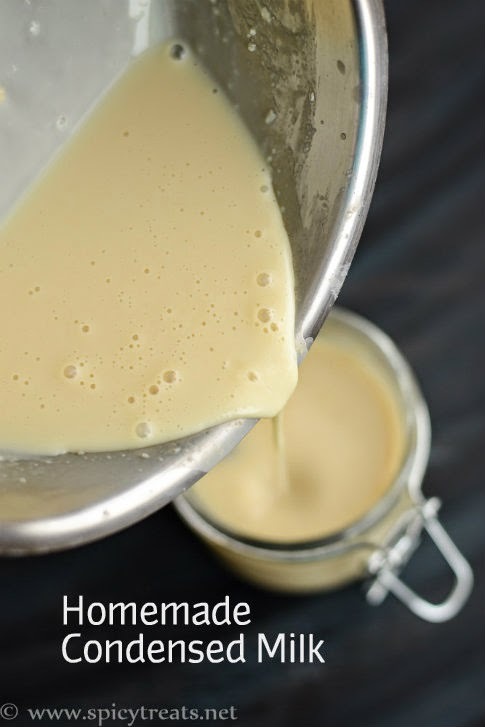 Have tried that way too, I always love to cook from the scratch and the homemade condensed milk from scratch using milk is really an awesome one. The flavor, taste, color and creaminess is unbeatable. More than the instant version love this one a lot. Even though it is a time consuming process, worth trying it for a great result. Just set your timer for 2 hours, and for every 12-15 minutes just give a gentle stir. As you are cooking in low heat it will not burn easily. You can see my pan in the step wise pictures. The bottom of the pan is clean without burnt milk solids. 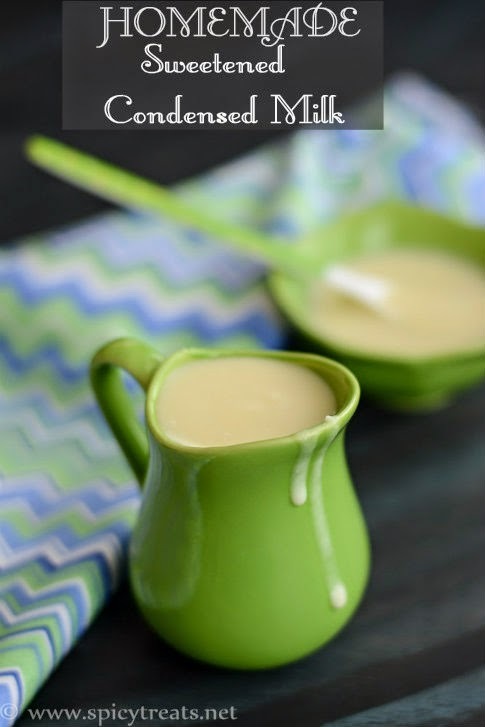 So try this basic recipe at least once to enjoy the real taste of sweetened condensed milk. I wanted to share these recipes here since long time and now sharing it for my Saturday's Kitchen Basics theme. After that, turn the heat to low and let the milk simmer for 2 hours or until it reduced to half and thicken. The mixture should be barely simmering and never bubbling at any point. Stir every 10-15 minutes or so to keep the milk from forming the "skin/malai" on top. I did one extra step, beaten the sweetened condensed milk using whisk when its still warm to a smooth milk. 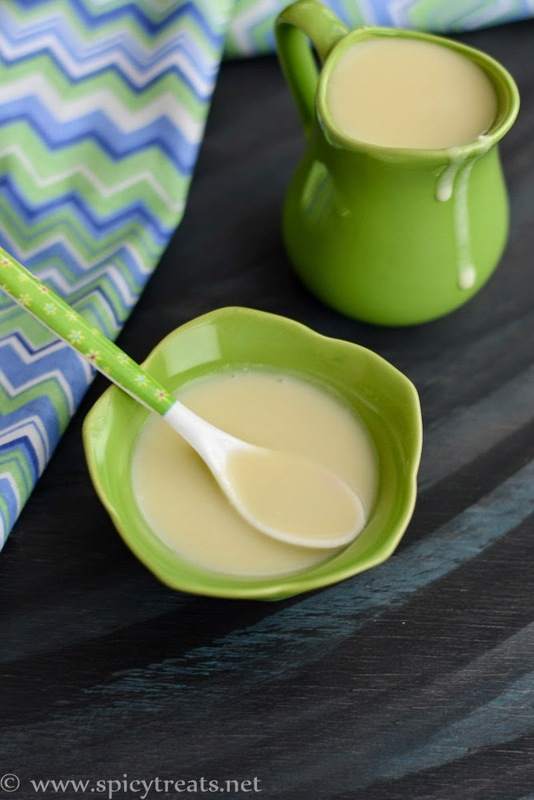 This Sweetened Condensed Milk thickens after cooling, so if needed add 1-2 tbsp of hot water and dilute the condensed milk. 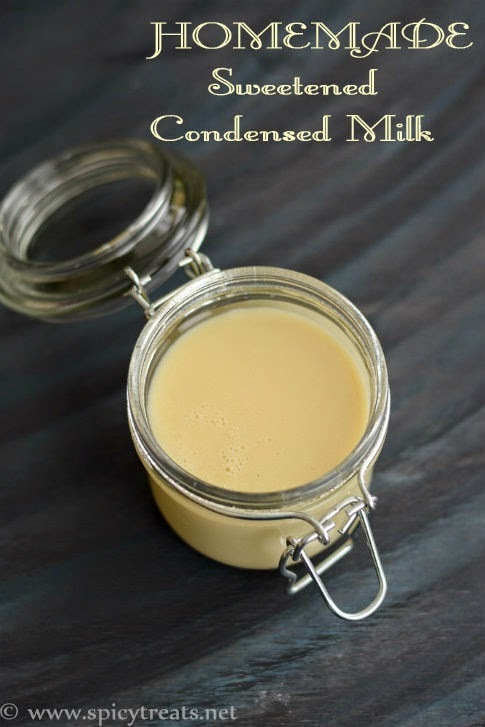 Homemade Sweetened Condensed Milk stays good in the fridge for upto a week. Store it in an clean air tight glass or stainless steel container in the top rack of refrigerator. If desired, you can flavor it with 1/4 tsp of Vanilla Extract after cooling. For Vegan option, You can use Coconut Milk, Soy Milk or any Nut Milk. You can also use brown sugar but i haven't tried with brown sugar. Next time will try and update here. UPDATE 3/16/2015 Condensed Milk prepared using Milk, the above method stayed fresh and good for more than 12 days in refrigerator. I stored in a glass air tight container in the top most rack on fridge. prepared in less than 10 minutes]. First in a sauce pan, bring 1/2 cup of water to boil rigorously. Now in a mixing bowl, add butter and sugar and pour boiling water over it. Mix well using an electric beater or wired whisk. Then add milk powder and mix until smooth. As i used whisk, the mixture was smooth but slightly grainy due to mawa powder. So put then mixture in blender and pulse it for few seconds. 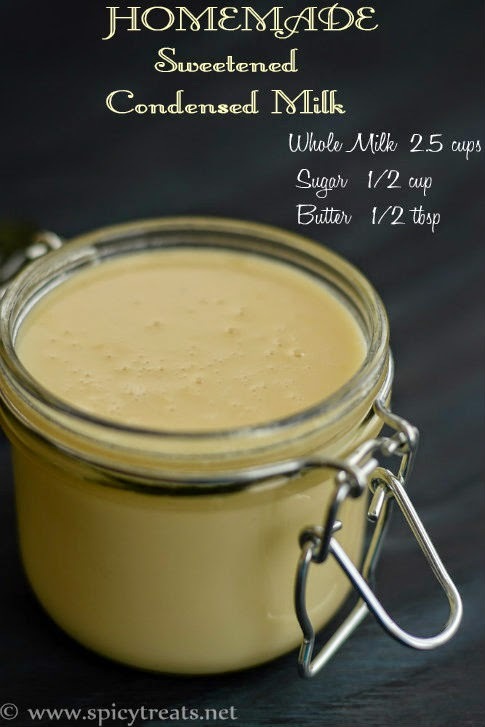 That's it...Instant Homemade Sweetened Condensed Milk ready. Store it in an air tight container. Stays good in the fridge for upto 1 week. I added extra 1 to 2 tbsp hot water to adjust the consistency. 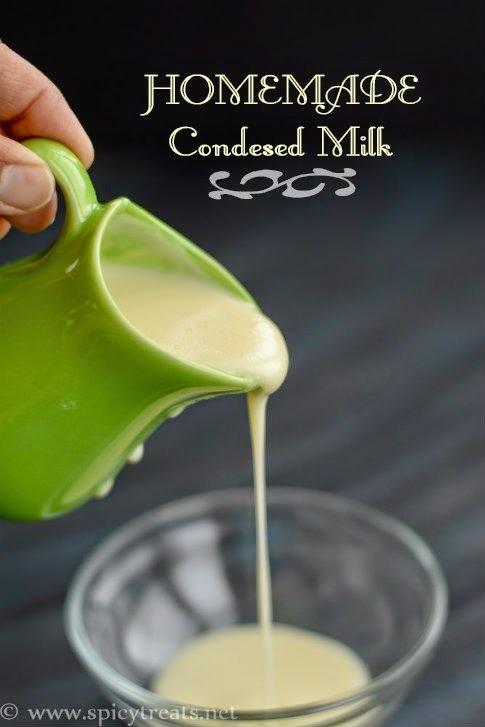 You can use condensed milk in any Eggless Cake recipes, the cake will turn out soft, airy and delicious. You can use it to make Milkshake, sweets, Desserts/Kheer. That's a really very helpful article. Looking great.